Well it is a forest product sirop if in parts of Canada Was wondering if anyone on here was doing it and wanted to due a post on it. There is a pretty good thread going on right now in the general board. Haven't put a picture on in awhile,hope it works. Tapped a week ago but it's not running yet . No. But I feel like I should. Have cut a few maples over the last couple of weeks and some just poured the sap. Dripped down on the ground puddled and then started running a small trickle down the hill. Just had to taste to see if just a hint of maple or sugar could be tasted. Nope and the sawdust wasn't any good either. Ed,should run today,or at least start. I should get into the high 30's. 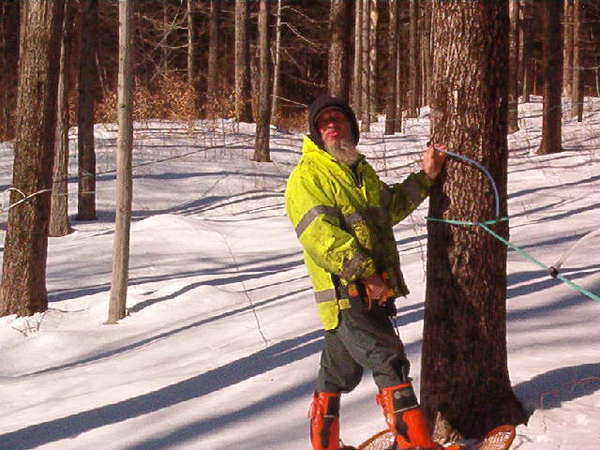 Still waiting for the trees to thaw here in central Maine. We should have about 200 taps this year. Running good today! Leaving the mud/woods now then collecting and boiling. Good Saturday night! 90 taps out, still waiting for the weather to cooperate. 3ft of snow pack isn't helping. 300 tap out and finially got 1 1/2 gals of syrup.This is the lastest i've ever seen the season start. Been sugarin for 53 yrs cept 7 yrs i lived in Tx. Ed,that is some interesting and is some scary. I guess it will all balance out come June. I hope!! You may have to tap some of those spruces since your maples will never thaw out. It will be as good as that fir siroop u had 2 years ago. I have about 450 tapped and hope to get up to 500 this year. Had a small run last week but nothing since. Better to sit in silence and have everyone think me a fool, than to open my mouth and remove all doubt - Napoleon. A little over 200 taps in, just a small run yesterday and now almost a foot of snow 28 degrees, maybe it will run today? rockwall,where in Maine are you? Are you doing the Maple Sunday event on Sunday? I'm in Cornville and no thank goodness, we haven't made a drop of syrup this year. 45* this afternoon and the sap is barely running .This is the weirdest yr ever. Wind from the West sap runs the best, Wind from the East sap runs the least. And remember " old sugar makers never die, they just evaporate". Not much happening in Petersham. In two days from now, tomorrow will be yesterday. We tapped about 500 today and will finish tomorrow. Still not running very much. Only got up to about 38 degrees today. Started by Ford_man on FOOD! FOOD! FOOD! Page created in 1.274 seconds with 39 queries.